Although the island of Tenerife lies only a little way to the north of the Tropic of Cancer, the unique combination of both Gulf and Trade Winds that sweeps the island, somehow prevent it from mirroring its nearest neighbour the Sahara desert. Santa Cruz de Tenerife is the capital of the island, a city of 230,000 people with golden beaches and commercial centres with fine shops and boutiques. The city is rich in art and history with several fine museums and theatres and well as sculptures and monuments. In the north of the island, Puerto de la Cruz is the main tourist area. This is a cosmopolitan coastal town which boasts a casino as well as its famous Botanical Gardens which date back to 1877. The old town of La Orotava has been declared of national historic interest which gives an idea of the monuments to be found there. Many hiking trails extend through the mountains of La Orotava and stretch up to Gran Circus de las Canadas del Teide, a protected national park. There are also magnificent botanical gardens to be found here, as well as three beautiful beaches. Adeje has a tranquil coastline, along with the impressive Barranco del Infierno, ravines with narrow vertical walls covered in vegetation. Ancient burial caves have also been discovered on ledges under the sea. The Canary Islands themselves are known for their year round sunshine and Tenerife is therefore a popular destination throughout the year. Temperatures range between 20°C in January to 26°C in August. Tenerife has been claimed as of Europe's best golf destinations and the most popular on the Canary Islands due to its warm climate, offering a wide selection of high quality golf courses for all level of golfers with the majority of them laid out within close proximity of the major Holiday resorts of Playa Las Americas and Adege. 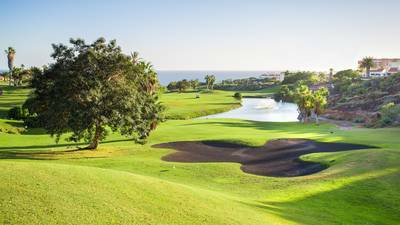 The sunshine island of Tenerife is the ideal destination for a winter golfing holiday, along with the golf there is the breathtaking scenery, dramatic mountains capes and fantastic beaches. One of the things about Tenerife which makes it such a great golf holidays destination is the fact that everything is so close by. A golfer could play a leisurely round in the north of the island, have a relaxing lunch and there will be still plenty of time to head south and tee off for an afternoon round at any of the island south courses. With only a few days rainfall per year, Tenerife is the ideal place to play golf all year around, Summer or Winter. You’ll find a variety of stunning courses to choose from, excellent facilities and perfect weather all the year round. The high season is from the October to April. 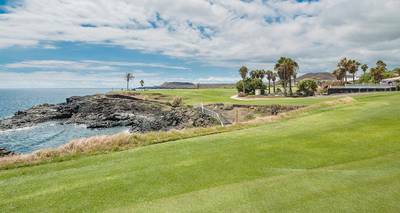 Book your golf tee times on Tenerife with Justteetimes.com, your one stop source for online golf tee times and green fees anywhere. 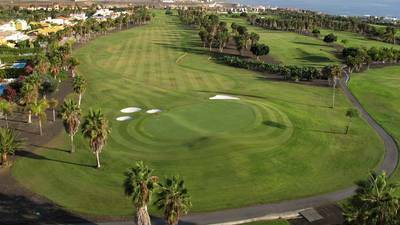 Golf del Sur comprises 3 nine hole loops, the Links, North and South courses, which can be played in 3 different combinations. Get a 3 Round Package to experience this fantastic golf course.